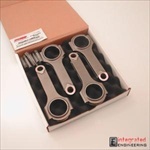 �VW / Audi 16v Engines IE VR6 connecting rods for both 12v and 24v VR6 engines. These rods feature the new 3/8 rod bolts instead of the older design using smaller 5/16 bolts. �ALL VW / Audi VR6 Engines & 10V VR5 On these kits ARP uses a top grade 8740 alloy, far superior to that of "aircraft quality". These are recommended when the greatest power demands are made from your engine. Combining strength and durability in a top notch product. ARP 204-5405 This stroker kit features a set of IE 20mm rods, custom JE pistons, and a specially modified drive pulley. This kit is "Bring your own crank" (BYOC), in that you need to source a MK4 TDI Turbodiesel crankshaft to go with it. We refuse to track them down and then charge rediculous rates to include them. It utilizes an 83mm bore JE piston to achieve 2067CC displacement. This is a very robust setup which is an upgrade from standard 1.8t parts in every way. It provides quicker spool, more torque off boost, and more power and torque per pound of boost. You will lower cylinder pressures at a given output, allowing you to stretch low octane pump gas (91-94 octane) further, making your car that much more of a serious contender on your day to day pump fuel. This kit allows the end user to quickly install a 2067cc stroker kit in any standard 06a block. The installation is no different then a standard rod and piston combination... Bore the motor to match the pistons using a torque plate, then build the motor as normal using the provided rods, pistons, timing belt pulley and a TDI crankshaft. Absolutely no grinding or other hassle is required! Includes 6 rods, 6 pistons, wrist pins, rings, and clips. This is a piston and rod combo pack for VW 24v VR6 engines. It includes a set of our high quality forged 4340 H beam connecting rods, and a set of 82mm diameter JE forged pistons. JE pistons are a notch above the pack. They utilize more expensive, and stronger 2618 alloy, compared to the more common 4032 alloy. They also feature beatiful machinework and fit and finish. These pistons are used in more winning race cars then any other brand. In addition, our connecting rods are proven to 750+ BHP for our light weight H beam design and are carefully inspected and tested right here in Salt Lake City. 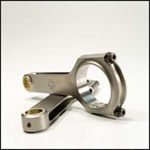 We go a notch beyond most connecting rod manufacturers in that we actually perform destructive testing on our connecting rods to ensure that every production run is up to par. This is what you need to build a very strong VR6 which will take virtually anything you can throw at it. 82mm is a 1.0mm overbore that works fine with the stock headgasket or the ABA headgasket.